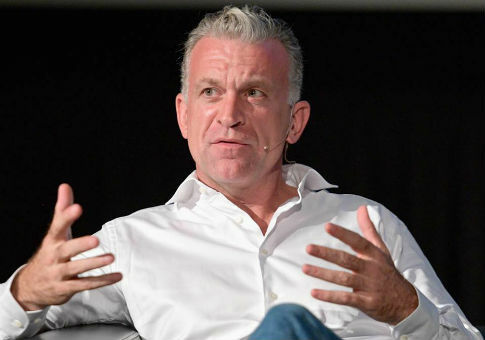 Former MSNBC host Dylan Ratigan announced Wednesday that he is running for Congress as a Democrat in New York's 21st congressioal district because "the political class has built a corrupt system that rewards themselves." Ratigan, 45, who previously hosted shows on MSNBC and CNBC and worked as an executive for Bloomberg News, is joining a crowded field of nine other candidates already vying for the district's Democratic nomination to unseat incumbent Republican Rep. Elise Stefanik, the youngest woman ever elected to Congress. Ratigan held a rally on Wednesday to officially announce his candidacy, saying that his campaign will be different than others and that he will focus on direct voter engagement. He added that he was "stunned by the lack of seriousness in our politics," according to the Hollywood Reporter. "I don't have the privilege of running polls and producing messaging because the other thing that distinguishes me from every other person in this congressional race is that I have a decade of Internet content of my big mouth running," he said. "I have thousands of hours of cable television, arguing with congressmen and senators, losing my temper and frustration and yelling. Can you imagine what my opponent will do with that video?" "Let’s face it: the political class has built a corrupt system that rewards themselves," Ratigan wrote on his campaign website. "They do just enough to get re-elected and reward their donors." "And instead of finding common ground, they hide behind partisanship and stalemate," he added on the site "No real plan for jobs. No solution for the opioid epidemic. No honest solutions for health care." After stepping away from his MSNBC anchor role in 2012, Ratigan started a hydroponic farming company designed to help reduce poverty and conflict in the United States and abroad, New York magazine reported. If Ratigan wins the Democratic primary, he'll face an uphill battle against Stefanik, who ended 2018 with $1.12 million in the bank. Donald Trump won the rural 21st district 54–40 in 2016, a swing from Barack Obama's 52–46 win in 2012. But Stefanik won't be so easily tied to Trump. She was one of 12 Republicans to vote against the GOP tax bill and she came under attack from one conservative group for doing so. "There are few Republicans who have turned out to be bigger disappointments for conservatives than Elise Stefanik," Terry Schilling of the American Principles Project wrote in the Hill last year. A run for office has seemed like the next stop for Ratigan since he left MSNBC in 2012. At the time, he told the Times his plans once he was off the air: "Basically my plan is to meet with tons of people, learn from tons of people, and then figure out a way to take the narrative I've been talking about, and show the most effective ways to resolve it." And even before that, he was getting in practice talking trash about [Donald] Trump. In a 2011 Q&A with New York, he called the future president "a draft-dodging, race-baiting phony who happens to be right about trade with China." Ratigan signed on longtime Democratic strategist and CNN contributor Joe Trippi to advise his campaign, according to reports. The University of Virginia's Center for Politics has given Stefanik a "safe Republican" rating, which means that Ratigan would have a tough time beating her in November, the Hollywood Reporter noted. "He's from the North Country, which might make him palatable to many voters," said Geoffrey Skelley, an associate editor for the center. "However, the problem for Ratigan or whomever the Democrats nominate will be that Elise Stefanik seems to be in a pretty good position to win reelection." This entry was posted in Politics and tagged 2018 Election, Bloomberg, CNBC, Elise Stefanik, MSNBC, New York. Bookmark the permalink.